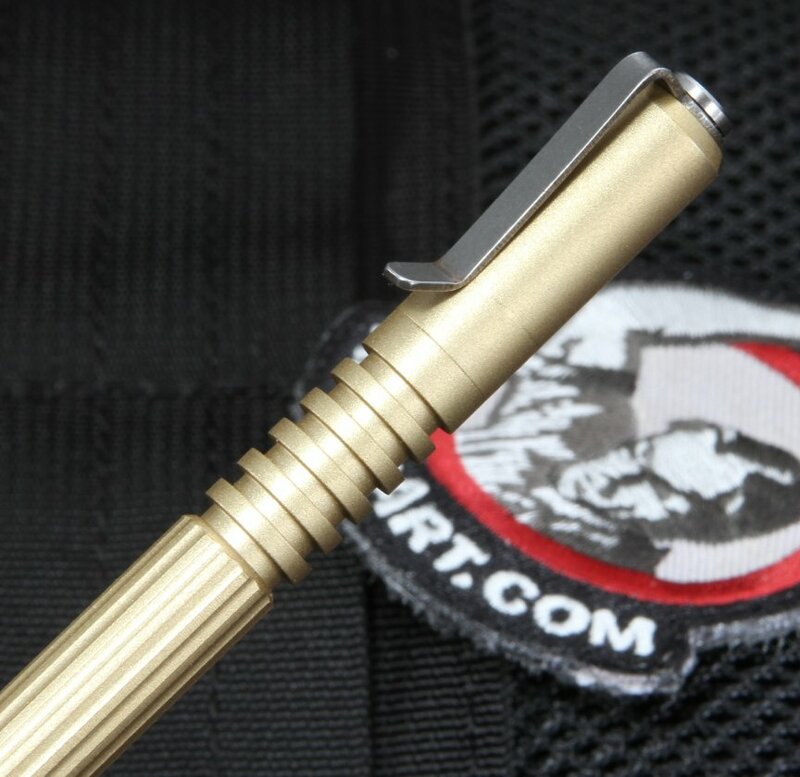 The Rick Hinderer Investigator Pen Brass is designed for users who need a compact, reliable writing tool that is also a discreet self-defense carry option. This tough, state-of-the-art compact tactical pen is the smallest one in the Hinderer collection - literally the smallest that the pen refill will let it be - but has the toughness of their larger models such as the Extreme Duty. Like their knives and other tactical tools, the Hinderer brass EDC pen is CNC and CAD/CAM-designed product that's made in America. 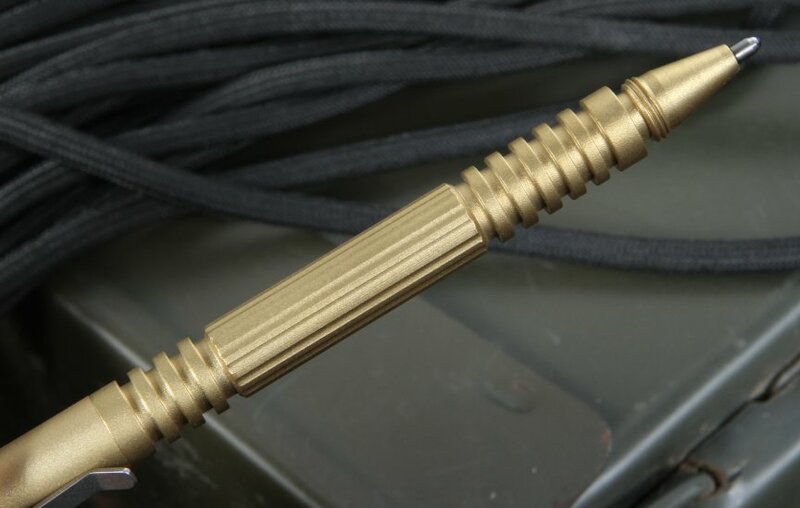 Enjoy the pen's ergonomic feel as you revel in its inherent protection on the battlefield or in the urban streets. 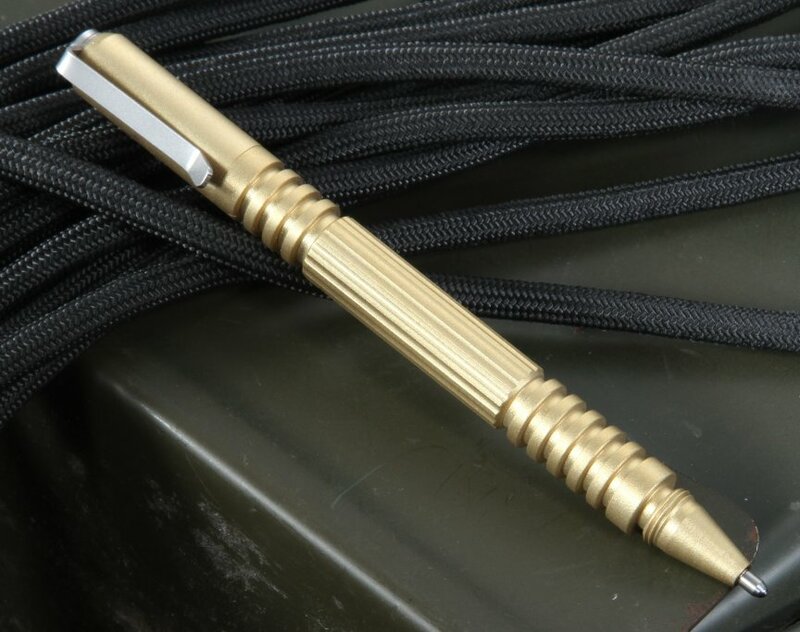 This rugged tactical device is not only a smooth writing instrument, but a close-quarters tactical protection piece as well. It writes in black bold ink that dries quickly and can be replenished with available Fisher Space Pen full size refills (pn# SPR4B). It is machined to withstand blunt force easily and ergonomically designed to provide solid grip as well as functionality. The titanium pocket clip allows you to easily carry the pen in a shirt or pants pocket and the overall size works great for small notebooks. You can screw mount the cap on back of the pen when writing. Both the cap and bullet have coarse threads that are stronger than a standard thread. Everyday carry is easy when you have a practical, light-weight, yet strong, compact device. Check out our designs, which are all proudly American made and feature a stainless steel bullet tip. The Hinderer Pens Investigator Brass Pen is 4.25 inches long, 0.375 inches wide and just 1.4 ounces in weight, but has the fierce ruggedness you need in close-quarter altercations. The brass cylinder has a bead blasted satin finish that adds a gleam to the elegant looks. It is also available in copper, titanium, hard anodized aluminum and stainless steel if you prefer. 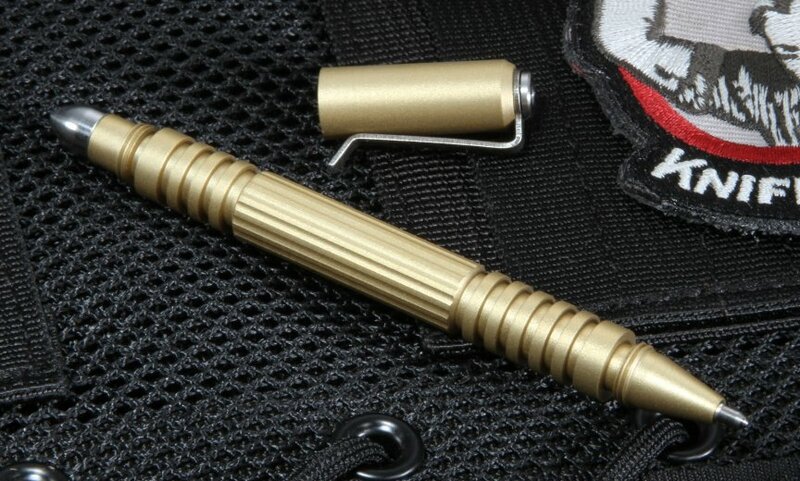 Looks match performance when you choose Rick Hinderer, as this brass everyday carry pen has latitudinal end grooves and longitudinal center grooves that meet your finger grip for better protection and quick defense even in its smaller size. The modular bullet tip can be replaced with strike warheads and other end attachments to meet mission or defense needs. It has an overbuilt construction to match the toughness of the people who rely on a tactical pen in their daily lives. 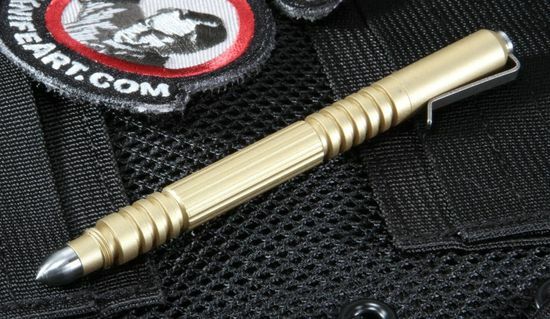 The slimmed-down design of this Investigator pen and beautiful brass material make it a practical choice for first responders and civilians. You'll always have something that can get you out a bad situation either with a well-written sentence or a well-timed strike. With fast, everyday shipping, you are assured a quick product delivery of your Hinderer everyday carry modular writing pen. We are an authorized dealer and you can order our curated merchandise with confidence. Our business model is as rugged and reliable as the merchandise we offer, and we are here to serve those who expect the best in their tools. That's why we offer a 100 percent satisfaction guarantee on top of the Hinderer Knives lifetime warranty. 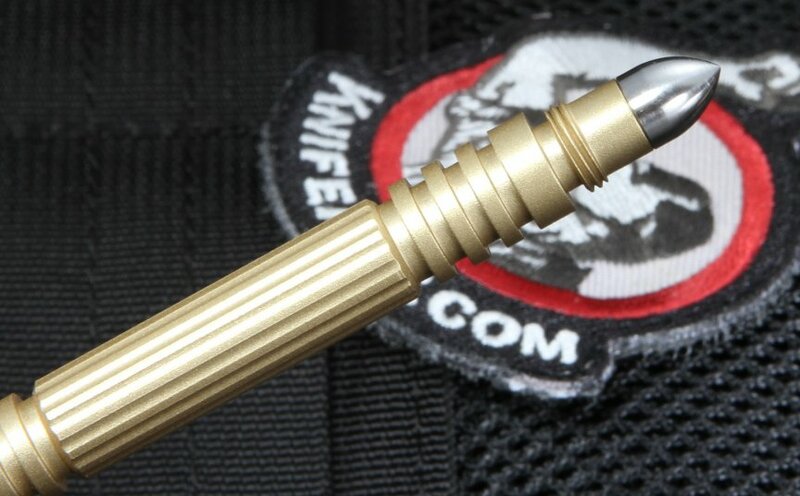 Total Size with Cap: 4.25"
Solid brass pen that demonstrates precision machining. Little to know chatter can be seen from the turned and milled body. The pipe threads for the cap and striker are smooth offering a constant tight fit. This is a pen first and a self defense weapon second. The clip could have been made a bit bigger for my taste but then the clip wouldn't fit the pen's ascetically. All around this is a fine example of precision manufacturing and functional art.